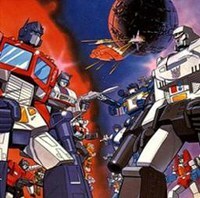 While many stations cancelled Transformers after "The Return of Optimus Prime," some were able to broadcast the "Rebirth" episodes. Meanwhile, Transformers continued in Japan with Transformers: The Headmasters (1987), Transformers: Super-God Masterforce (1988), Transformers: Victory (1989) and the OAV one-shot Transformers: Zone (1990). The "Rebirth" episodes are not part of the Japanese Transformers canon.